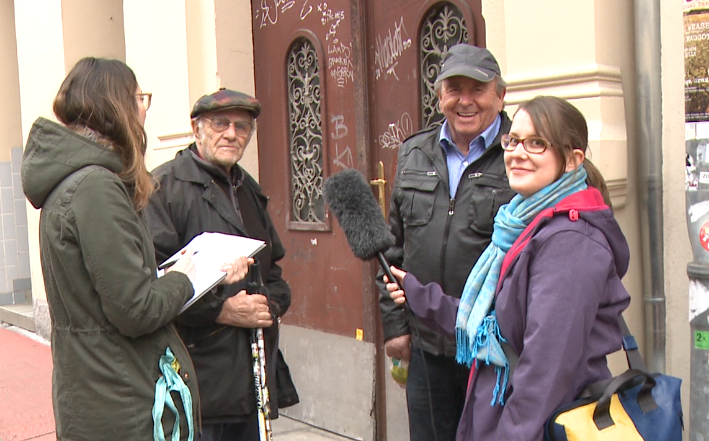 As we were looking for interview partners in the inner city district of Jakomini (start of the experimentation labs in Graz) we met two residents who have been living there since the 1940s. Karl (84) and Adi (77) have known each other since their childhood and have already experienced a lot in their neighbourhood. ʺThe neighbourhood is really beautiful nowadays, but you always need to lock up the house.ʺ Generally, Karl is an attentive and observing inhabitant of Jakomini. He once witnessed how someone stole a bike from the courtyard. Another time he saw two women and a young man kicking the side mirrors of a car. Karl didn’t hesitate and without further ado he called the police and gave them a detailed description of the three hooligans. ʺThe police found them in a park nearby the same nightʺ, he proudly mentions. Adi lives just around the corner in Mondscheingasse, he has been living there for 68 years. Today, the night bars close-by are a thorn to his side. ʺYoung people leave the bar in the middle of the night and start to riotʺ, he says. His own car was once wrecked, but the insurance doesn’t pay for these kinds of damages. With their motorbikes, Karl, Adi and their friends drove through the neighbourhood. Their gang was called the ʺMondscheinmöncheʺ. (engl. Moonlight Monks) They created the name themselves, it should symbolize their childhood and youth in Jakomini. Mondscheingasse and Klosterwiesgasse, that’s where most of them lived at that time and that’s where Karl and Adi still live today. The gang name is derived from the two streets they lived in: ʺMondscheinʺ (moonlight) comes from ʺMondscheingasseʺ and ʺMöncheʺ (monks) from the street name „Klosterwiesgasse“ (Kloster=monastry). If Adi could change something in his neighbourhood, he would consider a lot of things, but most of all he would make for more parking spaces nearby. Nevertheless, he is really happy here, as is his old friend Karl.